We received word from our solicitors on the afternoon of Thursday 21st July that the Admiralty Court had given us the comprehensive order were requested and immediately started the process of arranging to inspect, identify and remove Waiouru from Ben Harp’s compound at Hixon. It proved difficult to to arrange a crane and lorry before Monday so everything was arranged to occur early Monday morning. We had concerns the Harp’s might have already sold our boat and also be preparing to move it. The Document Server would serve the latest court order on the registered office of Ben Harp at 8:15am and then telephone me. I had arranged a rendezvous point close to Hixon where I briefed the police, Tim Tyler and the recovery coordinator. We then moved to Ben Harp’s compound only to find it locked and deserted. Looking through the fence I could see part of Waiouru in the poly-tunnel and immediately noticed some of the damage. 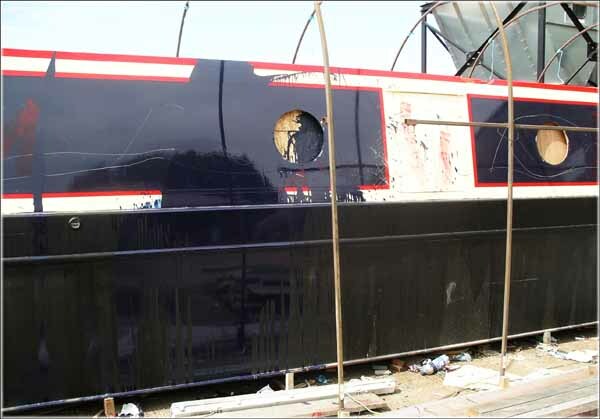 After opening the gates to the compound we forced entry into the poly-tunnel where Tim Tyler inspected the boat and confirmed to both myself and the police that despite the modifications it was the boat he had built for us. Almost anything of value had been removed from the compound and Ben Harp never appeared during the time we were present. This was the interior of Waiouru when we found her on arrival in the UK back in late May. Certainly not a £91,000 boat. 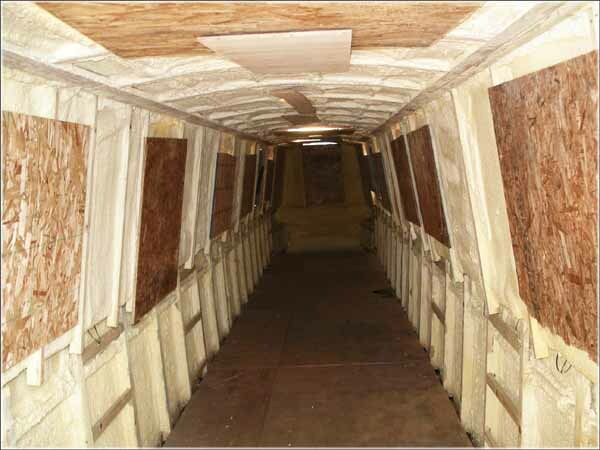 And this is the interior of Waiouru when we recovered her. The floor will have to be replaced as the ply isn’t to specification and has delaminated. In May the cratch had a locker and fuel tank with a lowered deck and storage underneath. Ben had a local steel fabricator remove the side lockers and raise the deck. Poor defaced Waiouru heads for a safe location where she will be lovingly rebuilt! next: Was it also attempted arson? This is such a sad looking boat now. 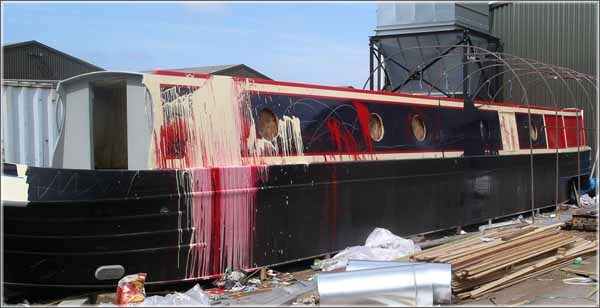 Have faith she will be restored to how she should look, and be all the happier a boat for it in time. When I got my present boat, a lovely Mel Davies tug, she had had an attempted drowning and burning too, but now being re-built, she is our happy boat! Time will dissolve the horror of this. Yes.... we will rebuild and live onboard. We will not allow this contemptible couple to destroy our dream! Our thoughts and best wishes go with you, Why haven't these despicable people been arrested and put away, Fraud, Theft, Threatening and abusive behavior all arrestable offences. 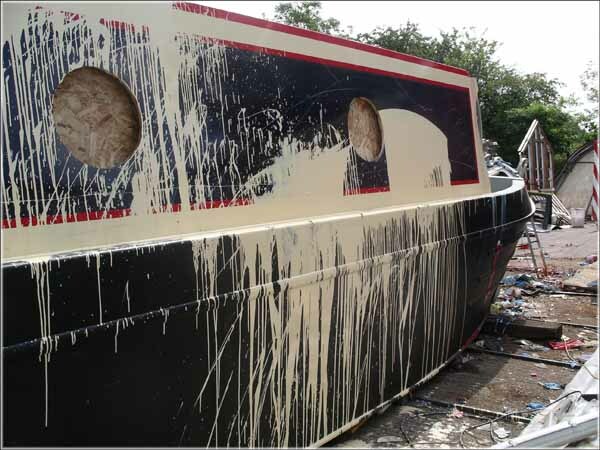 Who knows what the future holds for Ben Harp Narrowboat Builders Ltd. I can only say as far as we are concerned; this isn't the end of the story It's not even the middle! 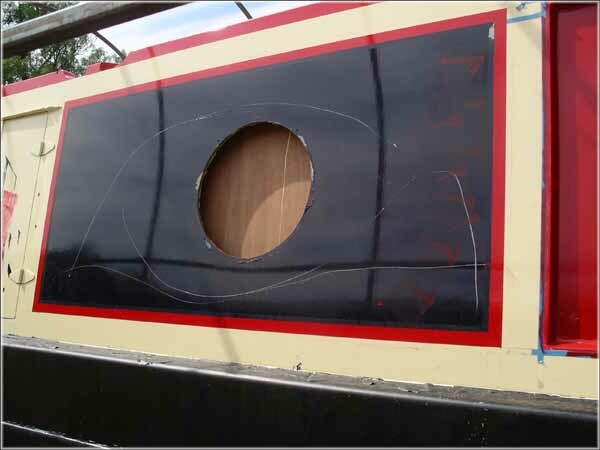 There is little point in pursuing a civil case against Ben Harp Narrowboat Builders as it is a limited liability company with almost no assets. If the case were to become a crimminal matter then YOU would be paying for their defence as I'm sure they would be asking for legal aid! 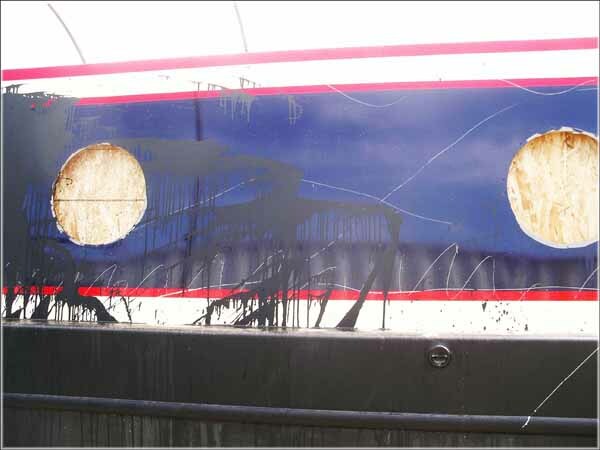 Since you owned the boat he vandalised, surely it's criminal damage? As you say, you may not be able to get money back but if he has a criminal record it will limit his ability to work again. I think I can speak for all posters here and say that any taxpayers money expended on legal aid etc would be a good use of public money if a conviction was secured, vengeance may be a petty emotion but it would certainly make me feel better! Well as far as we are concerned we haven't reached the end of the story. However our first priority is to rebuild Waiouru. Reading your blog is truly inspirational. Carolyn, my wife, saw Waiouru on the road between Lichfield and Stafford, earlier this month, being transported and came home to say she had seen a boat on the move. We didn't know what an adventure the boat and you had been through. When we saw the initial story in Canal Boat we tracked what had happened via the various blogs - it was truly shocking but nonetheless we were inspired by your attitude and courage. 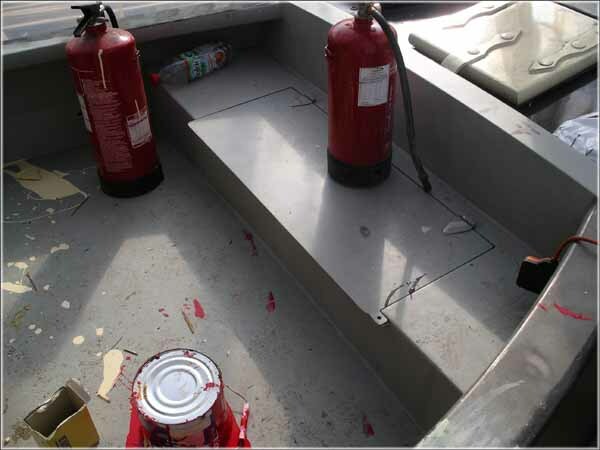 We also had been subject to a similar scam by someone who described himself as bespoke boat buildern -Mark Cooper of Prestige Narrowboats earlier this year - although he was much more reasonable and not at all vindictive in the way you have experienced. Thankyou for being so open about what has happened - it has helped us to get things in perspective as well as helping us to think and plan for the future. Our boat is L'Olinda and we have posted some photos etc on the blogger website. 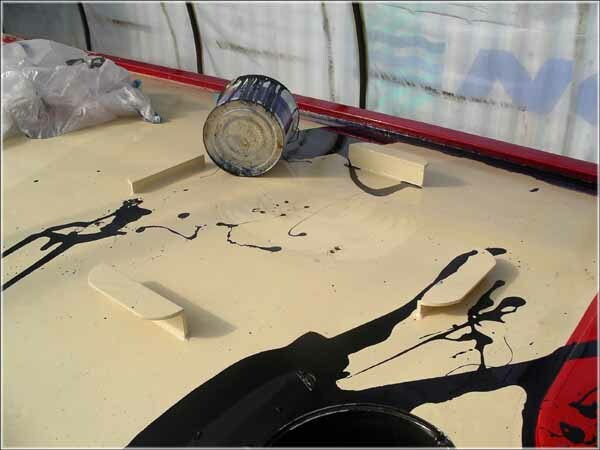 How awful to see this done to your boat. You have shown such courage and strength thoughout - an inspiration to us all. I'm so glad you were able to rescue her. More a determination that we were NOT going to allow ourselves to be helpless victims and be robbed of our boat!